History & Management. The Library has been an integral part of the Station's facilities since its founding in 1941. 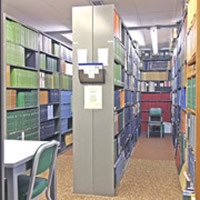 Building on the nucleus of Richard Archbold's personal collection, the Library has grown steadily by purchases and subscriptions and by many donations from individuals. The Library exists to enhance the research goals of the Station and is primarily for the benefit of Staff and visiting scientists. However, the collection is also an important resource for area biologists and for anyone interested in the ecosystems of Florida. The Library is a non-circulating research collection open to the public by appointment. The Library has interlibrary loan service. Subject Emphasis & Holdings. The Library collects material extensively in plant and animal ecology, evolutionary biology, conservation biology, limnology, entomology, ichthyology, herpetology, ornithology, mammalogy, and Florida natural history. As of June 2009, the collection includes 7,179 books, 7,500 bound periodical volumes, 3,300 Florida maps and aerial photographs, and 17,000 reprints. The Library has holdings in 400 serials and subscribes to 200. Access. The books are accessible through the card catalog and an on-line catalog (77% completed as of June 2009). The Dewey Decimal System is used and a shelf list and an author catalog were maintained until 1999. The serials are accessible through an on-line List of Serials. The reprints are filed by author and are not cataloged. The Florida quadrangle maps are stored alphabetically and are not cataloged. Other maps are stored by catalog number. On-line Catalog. 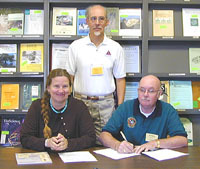 On 15 May 2002, Archbold Expeditions and the Heartland Library Cooperative (a 5-county public library group) signed a partnership agreement for cooperation in joint cataloging services (see top image at right). The Cooperative supplies technical services for Archbold including cataloging services,, software maintenance, and courier service. During 2003-04, the book collection was inventoried and culled, and bar-code labels were added to 6,100 books. As of June 2009, the catalog contains 5,234 books(77% of the total) and work is ongoing. Search Instructions. To confine searches to only the Archbold collection during this interim phase of catalog preparation, click on "advanced" search at the first screen of the catalog. At the second screen of the catalog, scroll down the page and select the Archbold library from the Library box. STABIB, the scientific bibliography of Archbold Biological Station, 1942-2008, contains 1,758 citations and is the scientific record of research on Station ecosystems. Reference. A collection of important reference books exists in the reading room. The Librarian renders assistance to patrons when needed and to questions by mail or by telephone. Photocopying. A copy machine is available for patron use. The charge is $.10 per page. Interlibrary Loan. Interlibrary loan service is available to Station Staff and Research Associates or to Visiting Scientists in residence at the Station. The Station Library participates in the Florida Library Information Network and the Library fills loan requests from other libraries. Depository Library. The Archbold Biological Station Library is one of 2 depository libraries (also Bodega Bay Marine Laboratory and Reserve) for the OBFS (Organization of Biological Field Stations) Newsletter and has a near-complete set (1967-2002), assembled in September 2003 by the OBFS Secretary/Treasurer Claudia Luke. Current issues are added to the set when published. Library stacks, periodicals: Botany in the left aisle and ornithology at the end of the right aisle.